Applications are currently closed. Sign up for our mailing list at the bottom of the page to receive announcements about our next round. On this page you can browse previous guidelines and listen to performances of past winners' works. 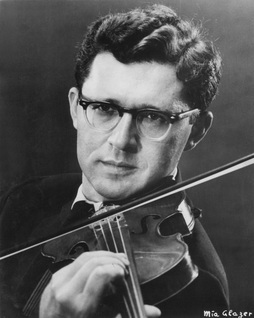 The great violinist and pedagogue Zvi Zeitlin was a champion of modern music. He traveled the world as a soloist with the world's greatest orchestras and a recitalist at the most respected venues across the globe, right up to his 90th birthday. He is well known for his recordings and interpretation of the atonal music of Arnold Schoenberg, including his monumental violin concerto. He premiered concertos written for him by Gunther Schuller, Paul Ben-Haim, and Carlos Surinach. During the second half of his life he was professor of violin at the Eastman School of Music in Rochester, New York, as well as at the Music Academy of the West in Santa Barbara, California. He traveled the world giving masterclasses and teaching the next generation of violinists. Zvi Zeitlin was born in Belarus, raised and educated in Israel, and was the youngest scholarship recipient ever at the Juilliard school in New York (at age 11.) He was a member of the British Royal Airforce during World War II, and performed for Allied troops across the globe. Mr. Zeitlin was a true global citizen and a promoter of the music of his time, and thus a perfect model for the mission and goals of Cuatro Puntos. We thank the Zeitlin family for their support in making this competition possible. GRAND PRIZE, SECOND PLACE, THIRD PLACE- The pieces selected for the top three prizes will be performed extensively by Cuatro Puntos between 2016 and 2018. (see lists of current and past events to see the scope of Cuatro Puntos, with over 50 concerts a year, and seven countries visited in the past two years.) These pieces will also join the winning pieces from the 2014 competition on a studio-recorded album released by Cuatro Puntos. Watch a performance in Florianopolis, Brazil of the piece chosen as the grand prize winner in 2014 - The Day Is On Fire by Andrew Stiefel. This work was performed on about a dozen concerts in three countries, and will be released on our album with the other 2014 winners and the upcoming 2016 winners. These artists will receive formal recognition of these awards on all publications and web media regarding the competition. Their pieces will also receive the highest consideration (after the top prizes) for performance by Cuatro Puntos. Emerging Composer's Award - Awarded to an applicant age 18 or under at time of Deadline. (please note that the judge's panel will not know the age of the applicants, and therefore age is not a determining factor and will not increase/decrease chances for Grand Prize or Runner Up prizes. Once these awards have been chosen, scores written by composers age 18 and under will be sorted and re-evaluated for this award. Award for Unique Instrumentation - Awarded to an applicant who effectively utilizes non-traditional instrumentation in chamber music. Cuatro Puntos Award - Awarded to a composer whose work includes flute and strings. All scores submitted will be considered for programming between fall 2016 and summer 2018. We will keep them on hand and choose scores based on the themes and instrumentation we need. The Zvi Zeitlin Memorial International Composer's Competition is open to any composer of any age, from anywhere in the world. It is through this competition and score call that we develop new relationships and meet interesting composers and musical minds around the world- ones who we would never find in our own seeking. Applicants' name, age, and background will not be revealed to the review panel. You should send any score for small ensemble that you feel strongly about. The instrumentation or number of instruments the score is written for is not important, as long as it is written as chamber music with one on a part. A recording (live or midi) should be submitted with the score when possible. A description of the piece, its conception, meaning, and/or compositional process is also recommended. INSTRUMENTATION- We are accepting scores for any instrumentation and number of players, and we are not strongly considering instrumentation in our choices. We can always bring in extra musicians for performances of a particularly compelling piece, as needed. However, we would like you to keep in mind that it is easiest for us to perform pieces that include any number or combination of violin, viola, cello, bass, flute, or oboe. Pieces that include any combination of these instruments, as well as possibly one or two other instruments, will get more performances than a piece that does not contain any of our core instrumentation. THEMES- One of the things we look forward to about this competition is that we receive all kinds of new ideas for concert themes. However, we are always particularly looking for pieces that fit with our mission statement: "Cuatro Puntos is dedicated to global cooperation and peace through the writing, performance, and teaching of music worldwide." Our 2015-2016 season theme is "Musician Warriors: Celebrating Those Who Have and Do Create in the Face of Adversity." Our 2016-2017 season theme will concern the international refugee crisis. Pieces that have any sort of theme concerning acceptance, cross-cultural dialogue, underrepresented people, oppression, etc. will fit our mission well. Other ideas include: pieces that delve into musical traditions outside of the Western Classical world; pieces in response to war or violence; pieces in response to current political issues; pieces about (or from) musicians in parts of the world facing oppression. Scores will be reviewed by a panel of composers and musicians. Any marking of the composer's name or dates will be whited out before the scores are submitted to the panel, and the composer's resume/bio will not be considered in the decision process. A description of the piece, its conception, meaning, and/or compositional process may be provided for consideration with the score, if desired. This description should not contain the name/dates of the composer. The review panel will be headed by Cuatro Puntos' composer-in-residence, Dr. Sadie Harrison. This helps us offset the cost of hosting such a large-scale competition. Don't want to pay this? Consider a contribution instead! In lieu of the application fee, we ask that you consider a tax-deductible contribution to the ongoing international and New England outreach done by Cuatro Puntos. Any applicant who makes a donation of $30 or more will have the $15 application fee waived, and will receive a tax letter for the deductible contribution. Your name will appear a sponsor in our programs and on our Support Page. Become part of the international network of people dedicated to using music to solve some of the world's social and political issues. Click here to make a contribution.